Blog Ask the Denturist: Do You Really Need to Remove Your Dentures Before Going to Sleep? One of the most common questions we are asked is “why do I have to remove my dentures before I go to sleep?”. It’s an honest question, as at first the idea of sleeping with your dentures in seems harmless enough. However, wearing dentures changes your oral hygiene requirements, and removing your dentures before sleep plays a part in keeping your mouth and gums healthy. In this article, we’re going to break down the reasons dentures need to be removed during sleep as well as go over some hygiene considerations. Resorption is a gradual process where bone volume and density is decreased. This process is ongoing, but significantly accelerated when wearing dentures all day and night. Both partial and complete dentures should be taken off and stored at night. This gives your gums and jaw bones much-needed rest- it’s also a good chance to clean and disinfect your dentures! Your body continues to make bone mass throughout your life. As we age, this ongoing process is responsible for changing bone mass based on the needs and demands of your body. Resorption occurs when the body fails to replace lost bone mass faster than it produces new bone. This can be because needs have changed, such as when natural teeth are lost. Natural teeth cause the body to continue to produce bone mass for the jawbone. When they are lost, the needs of the jawbone change and resorption begins to occur. Wearing dentures puts a small but consistent amount of pressure on your gums and the bones underneath. Over time, this pressure can cause discomfort and, with continued aggravation, develop sore spots along the gumline. This process is exacerbated when dentures are worn all day/night, as increased resorption negatively influences denture fit. When dentures don’t fit correctly, they place additional pressure along the gums. 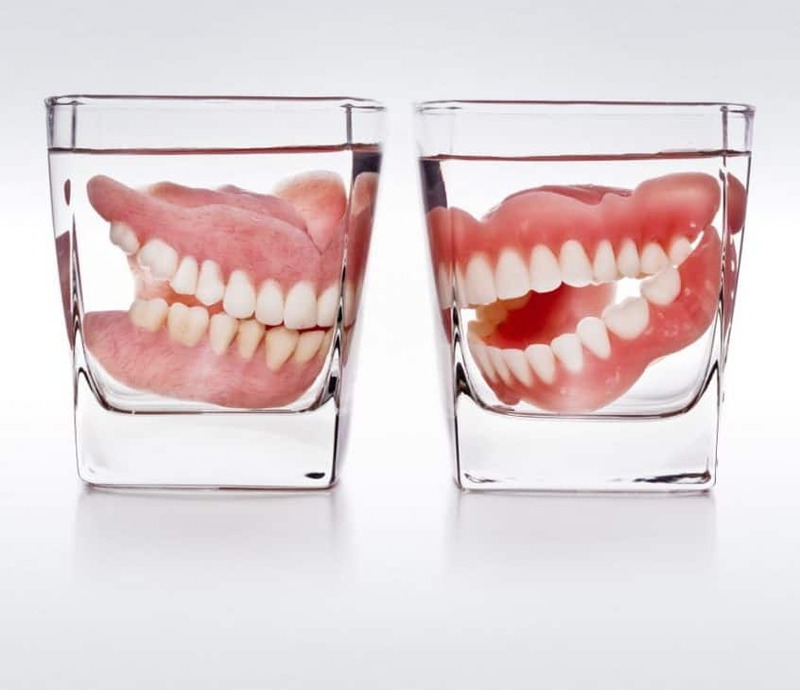 If your dentures don’t fit properly, we can help! So long as your dentures are serviceable (generally, made within the last 7 years), we can refit or reline your dentures! Learn more about denture retrofits. This is an important part of the conversation. Many people forget that dentures – even when they fit perfectly and comfortably – are not natural teeth. Dentures have different hygiene requirements, and one of the biggest differences is in keeping the mouth clean. Bacteria, viruses, and other germs love to set up shop in the tiny nooks and crannies that exist in your mouth. Removing your dentures and keeping them clean, in addition to staying on top of your oral hygiene, prevents microbes from causing infections (and other problems). Proper hygiene helps prevent mouth odours, illnesses, and discomfort from pathogens. In Short: Be Sure to Remove Your Dentures Before Bed! In addition to the above items, wearing dentures overnight can also impact salivary flow (which can lead to a condition called stomatitis, where the tissues underneath dentures become inflamed). As you can see, there are several reasons why removing dentures before bed is a good idea! Removing and cleaning your dentures every night will prolong the life of your dentures, improve your comfort when wearing them, and keep your mouth healthy. Learn more about keeping your dentures clean.